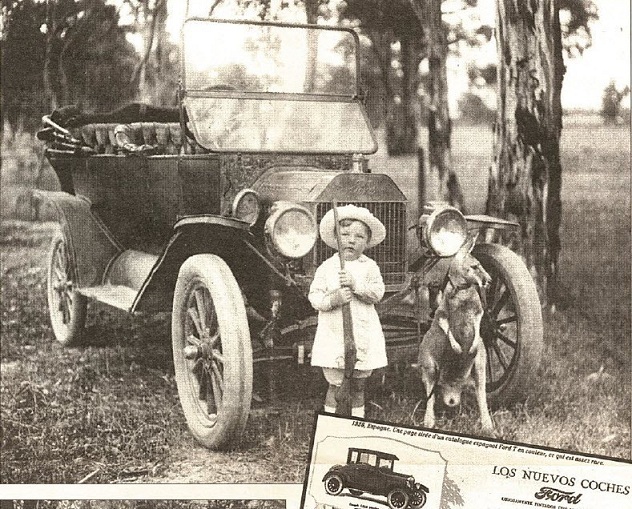 I just "refound" an article about the Model T which was printed in a Spanish newspaper 20 years ago. There is a collage of pictures and I'm not up to speed with photoshop so the little tyke's feet will have to stay covered up. I don't know much about Kangaroos, but am assuming this one must have been trained to stay on a leash? Must have been some really jerky riding if the owner was using it to pull the T! Holy cow...you suppose that's a PET Kangaroo? Looks like it's got a collar and leash on it!! Them are some big tires on the front! A great picture Eric, thanks for sharing it. I have seen lots of original Aussie T pictures but never that one. Are you able to tell us any more about the article with the photo? It may help to locate where the picture was taken. Looks like a small Eastern grey Kangaroo so it most likely Southern Australia? Very rare for one to be kept on a leash as a pet. Mark, standard issue for5 Canadian cars is for 30 by 3.5's all round. Yes, but thoes tires are way bigger the just 3.5's. They were a size used on midsize cars during the '10s, available in both clincher and straight side high pressure type. The common today 30X3.5 is an oversize and is actually a 31X4 clincher. It is a long story going back to typical bureaucracy during the Great War (WWI). Neat photo! Thank you Eric S! Warwick, there is no reference made in the article other than the year (1914). The picture just caught my eye and I thought you all would enjoy it. David, thanks for the link. That's a much better copy of the picture! Now I can see that the car has shock absorbers on the front as well as some other details, like the little nipper's shoes! the dingo's ate all the dogs down under so they use roo's for trackers. Here is another one for you...love roo, good eating. You can buy it at most local supermarkets now. Very tasty. Photo courtesy of Ian Duncan Smith & the Duncan Family. 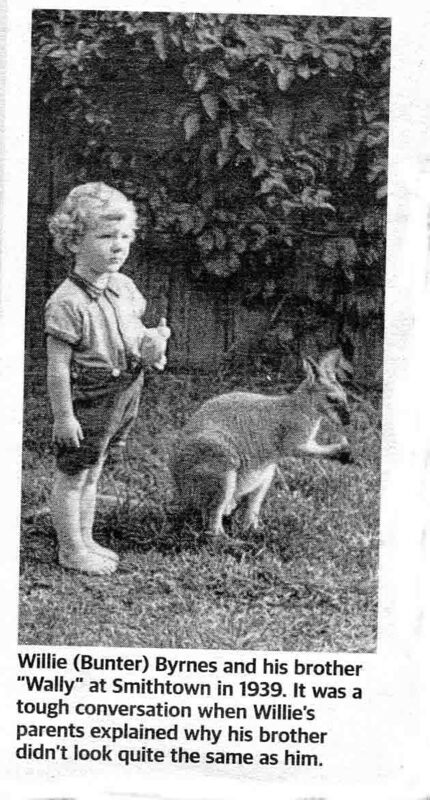 About 25 years ago, my uncle had a pet 'roo on his farm. It was so attached to the family that when the school bus picked up my young cousins the thing would race the 15 miles across country and be waiting at the Lockhart school for them to get off the bus. To keep it under control they would have to keep it penned up until well after the bus left. On the odd occasion when it did get to the school, the local copper would walk it down the street and lock it up in "cells" until my uncle could come into town to retrieve it. After several years they had to destroy the thing because it was maturing and becoming a problem. Adult kangaroos are quite tall. As seen in the 2nd pic. Can be scarey when they jump in front of your car or stand there and stare at you when you are wandering thru bushland. So does roo taste like chicken? More like rabbit to me. Great cooked on a BBQ, a lovely lean meat. David, I have a story that I'd like to check the validity with you. Several years ago a fellow I worked with in Owatonna Mn took a business trip to somewhere in Austrailia. While there he went out a couple nights with some of the local "sportsman" and shot kangaroos when they'd see them illuminated with car lights. Is this a common practice? I know it's done frequently here in the States but I believe it's illegal in most States. I know it's illegal here in Minnesota and as a hunter think it's one of the most chickens_it methods of hunting there is. The method was used a lot during the depression in order to feed families and I've got very little problem with that. But the slobs that do it now aren't considered much for sportsmen. Actually I believe this method has been used for jack rabbits as well when there was such a heavy infestation of them. 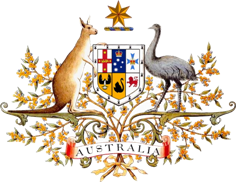 All states and territories have legislation to protect Kangaroos but are harvested on a permit and quota basis, no one farms them, just to many all over Australia. Spot lighting is they way to shoot them and must be a clean kill. Frank, I like that better than poisoning like they do with some critters. We had US visitors here for a National T rally in 1992. We took them for an evening meal before a night visit to a wildlife sanctuary. One fellow decided he'd try Kangaroo steak and ordered it well done. The chef sent back a message that he could have it just better than rare or not at all, so he settled for it to be done well! He was most taken by the experience and looked forward to repeating it. Unfortunately, when he asked for it when we were on our road trip east, he was advised that it was not available for human consumption. We had crossed the state border and the rules were different!! So much for Federation between the states. Nowdays the eastern states have caught up. My favourite is a Kangaroo mignon at our local. So cool that we can actually eat the animals depicted on our Coat of Arms!!! Have had a few meals of Kangaroo, but never tried Emu. How is it David? Maybe really, really, big Emu drumsticks for Christmas dinner at your place??? I used to raise emus in Florida. It's a red meat like beef with less fat and cholestrol than turkey! Tastes like beef. The eggs have such a mild taste that if made into an omlet, it taste like whatever you put with it. I tried emu up in the NT when I worked out at Yulara and Uluru. Not my cup of tea I must say. Tried camel out at King's Canyon, had a pie, not bad at all. Nothing like a bit of Skippy though on the BBQ. I find kangaroo meat on menus quite rarely these days. However, about 10-15 years ago it was much more common with people testing the "new" taste. The taste is often described as "game-y". A bit like beef but stronger and much leaner. I found Kangaroo sausages once and tried them, but I wont again. I've never tried Emu meat and I don't know anyone who has, but I do love lamb. 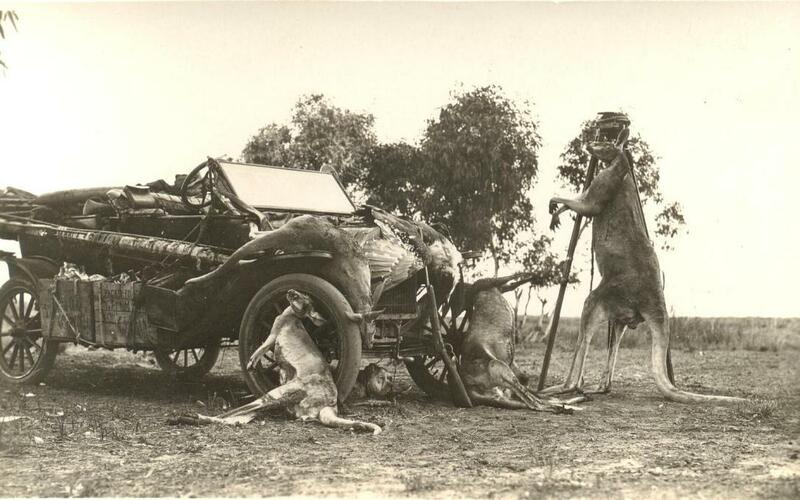 In my teens I used to hunt Kangaroos, pigs, goats and on one trip we cooked Emu. suspecting it would be tough meat a young one was chosen. The meat was so tough we quickly found out why it was not being suggested as a source of meat. Kangaroo on the other hand is a meat which some have already stated is fairly normal. Took some to a bar-b-que once and no one picked it as being anything other than beef. coincidental in todays paper they have an "your favourite photo's " page and this was amongst them. Kangaroos were popular pets up until the 1980's I had a friend who had one who lived in the house and had his own bedroom. I guess we're not supposed to eat the animal that represents our national symbol. I've heard it tastes like trumpeter swan but haven't taken the opportunity to try it. It's interesting here in Minnesota we have seasons for deer hunting with the hope of controlling their populations so we don't run into them on the highways. I wonder how many more would get killed on the highways if we didn't have the hunting seasons. There doesn't seem to have been much of a decrease in deer/auto collisions. In a lot of instances there's been an increase. Our winters do a better job of controlling the populations. Rabbits, hares, goats, camels, water buffalo, cats, dogs, pigs, rats, donkeys and deer, I'm sure I've mist some others, and sometimes there is even talk about thinning out the horses in the high country. They've done a couple of major Brumbie culls in the Barrington Tops already. From memory, in the Brindabella's too and probably elsewhere. Can we do a deal with the Japs to take all the feral meats from us and leave the whales alone?? There is room, I believe, for all of God's creatures- On a plate, Right next to the roast potatoes. 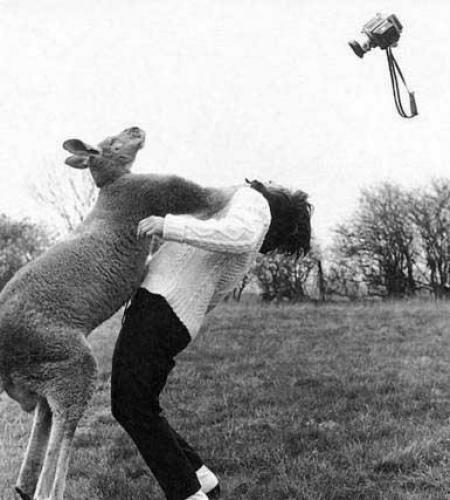 For visitors coming to Australia --Be careful taking pictures of female kangaroos before they have put their makeup on. In the second pic, what is the big bird draped over the radiator? Not an Emu, short neck and flight wings. Could be a Wedge Tail Eagle. They were shot by farmers because the stole lambs. You could loose a whole seasons lambs with just one pair of Eagles. They are now protected.